Hi everyone. 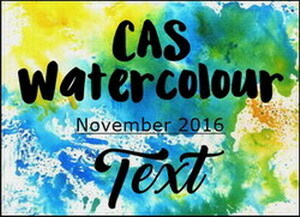 Just a reminder the challenge at CAS Watercolour for November is TEXT (other than a sentiment). Having more fun playing with Brushos. This is a technique I tried when I had a play day in my studio with my friends, Susan and Christine. The technique combines Brushos with spray starch and cling wrap. First I sprayed a piece of mixed media paper with spray starch. Then I sprinkled with Brushos Colour Crystals. The starch seems to hold them in suspension. I took a piece of cling wrap and placed it over top, scrunching up the wrap as I put it over the Brushos. Then I left it for about 1/2 hour to dry. The colours tend to pool in the creases of the cling wrap. When I removed the wrap, this is the design I got. Love it!! So artsy! The panel was still a little wet, so left it to dry completely before heat embossing this awesome text stamp that I've had for ages. My sentiment is on the inside of the card. There are lots of fantastic cards in the gallery of the challenge already. Why not check them out and come join in the fun. 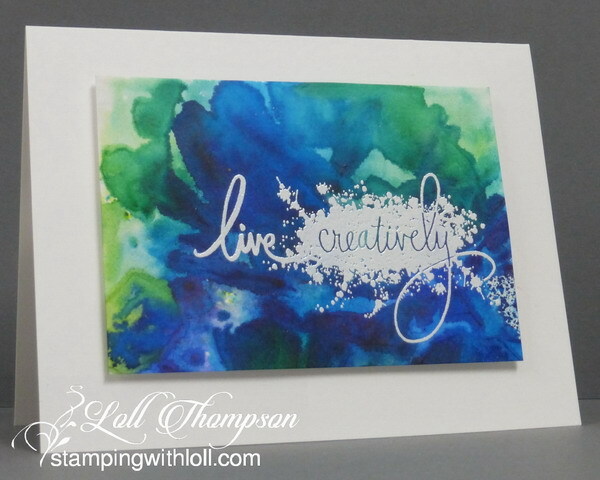 Make a CAS (Clean and Simple) Watercoloured card with TEXT (other than sentiment) and play along. The challenge is open until end of day Nov. 24th. Very pretty background Loll. Lovely card with the white embossing. A gorgeous background, Loll! Love those words of wisdom! Ummm....fantastic! I've tried the cling, but I didn't get the super result that you have on this beautiful card. Love the way you've done the text! That white embossing just wows! TFS & Hugs. Spray starch and cling wrap. I haven't even tried Brushos yet! You must have loved science in school ;) Had to come take a gander at all the tag loveliness happening since I've been gone. Love this artistic beauty too. Another gorgeous card, Loll! I love how your background turned out, and will definitely try this technique! I also love the effects of your embossed sentiment...very cool! Thanks for the step-by-step tutorial! I have no idea how you come up with these unique and different techniques but they all look so fun with amazing results! The word stamp is wonderful embossed in white and what a great stamp that is! What a great card for so many occasions particularly with that brilliant background. the background looks awesome with the stamp, love the striking white on those striking colours. Awesome bg, Loll - where do you come up with all these fab ideas????!!! Love the drama of the bg with the bold white text! BTW, I just used your smooshing with inka gold technique (and linked to your video) for a card tonight - love how it turned out, so thanks for the inspiration! You are so creative with your different background creations! This is beyond stunning! Oh Loll this is amazing - love that text stamp - it is perfect embossed in white over the strong colours of the background. Gorgeous! Wonderful colors and a good thought to remember! :) Hugs! That spray starch background turned out beautifully - it is so vibrant (and of course I love the colours!). A perfect contrast for the white text stamp! The minute I saw this I had to quit what I was doing and try it. Messy Messy Me. I forgot my gloves and went a little heavy handed with the starch. I kept going and scrunched up the wrap on top and let it dry quite a while before removing it. I must say I was a little skeptical because Brushos and I have a love-hate relationship but I was astonished to see a beautiful but still very wet panel. I heat dried it, not a good idea because it warped a lot but after running it through my Big Shot between printer paper it looks amazing. Now I just have to decide what to do with it. Thank you for your adventurous nature, Loll, and your willingness to share. I love this...so happy looking. I have that technique on my list to try...thanks for inspiring. Absolutely fabulous Loll! And another idea to try as well.